Despite beards and man buns being on their way out, skinny jeans fading, and bread pudding in mason jars making way for gelato, the global hipster movement has left a mark on American lifestyle. Across the country, demand continues for neighborhoods where you can bike to coffee, pick up peaches at a farmer’s market, or get some culture at a local gallery or art walk. The U.S. has seen a decisive resurgence in urban living, driving people in their 20s and 30s to pick cool, walkable areas over remote cul-de-sacs. What does this mean for investors looking to benefit from the demand? Mike Greene, head of Partner Development at HouseCanary, and I pulled on HouseCanary’s Home Price Indices data to find out. A good accountant will tell you that you shouldn’t spend more than 30 percent of your income on your home. Ten years into the current housing cycle, however, there are few places on the coasts with 30 percent affordability (defined as percentage of household income consumed by a house payment). The popular Mission District in San Francisco hasn’t seen 40 percent since the year 2000, when it was gritty, unsafe and actually more affordable than the rest of the city. A trickle of affluent residents turned into a flood in 2008, and affordability flipped. 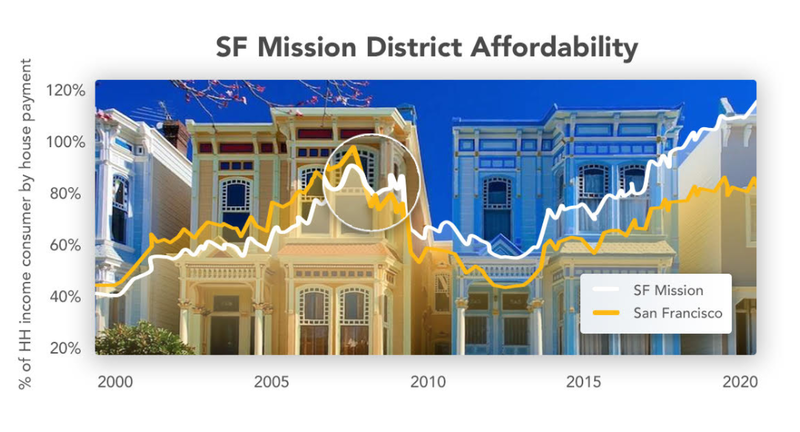 Since then, the gap has widened, with 100 percent affordability (completely unaffordable) in the Mission versus 75 percent in the broader San Francisco metropolitan statistical area (MSA). We’ll likely observe a similar dynamic in other U.S. neighborhoods, and investors can use the local affordability trend line to zero in on properties with upside. On the opposite side of Manhattan Island from hipster (and already unaffordable) Williamsburg lies Hoboken, N.J. Nearly 50 percent of its population is between 20 and 34 years old—and it’s not just because of its proximity to Manhattan. 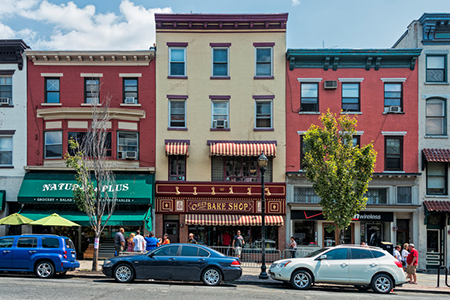 Packed into Hoboken’s mere square mile are venues like Northern Soul Bar, Garden Street Farmers Market, Arts & Music Festival and Hoboken’s Food & Culture Tour—all examples of a growing urban vibe. More importantly, Hoboken’s affordability is at a mere 35 percent and still comfortably below that of the N.Y.-N.J.-Long Island MSA’s 40 percent—and clearly below that of Manhattan itself, which ranges from 60 percent to more than 100 percent. Compiled into a HouseCanary e-book, we looked at the top 19 hipster enclaves identified by CBS News and found a number of other gems. The Clarendon neighborhood in Arlington, Va. is one of them, with its Home Price Index accelerating rapidly versus that of its broader MSA—and its affordability chart looking not unlike that of San Francisco’s Mission. If you’re data geeks like Mike and I, you’ll enjoy seeing how HouseCanary’s Home Price Indices are helping some of the biggest real estate investors decide where to buy or sell next. We certainly enjoyed quantifying where the cool kids are moving—and making sense of what it means for those who’d like to follow their nose for cool. Martin Morzynski is CMO of HouseCanary. For more information, please visit www.housecanary.com.